Anyone who has ever been a new kid in school will understand my overwhelmed feelings the first day I walked into the fourth grade classroom at St. Thomas More back in 1972. I was nine years old and had been living overseas since I started school. This Catholic grade school in Houston, Texas was just as foreign. And I was one of the only children in the whole student body with divorced parents. An oddity. Every grade had two homerooms and each homeroom had 30 children. So many more students than I was used to. I gradually got to know the other girls and boys in class and joined the Girl Scouts. I made friends with a small group of girls that are still among my best friends today. We picked up a few more in high school to round out our gang. Last weekend, instead of baking these cheesy spicy muffins for posting today, I was celebrating our collective fiftieth birthdays in the party city of New Orleans. 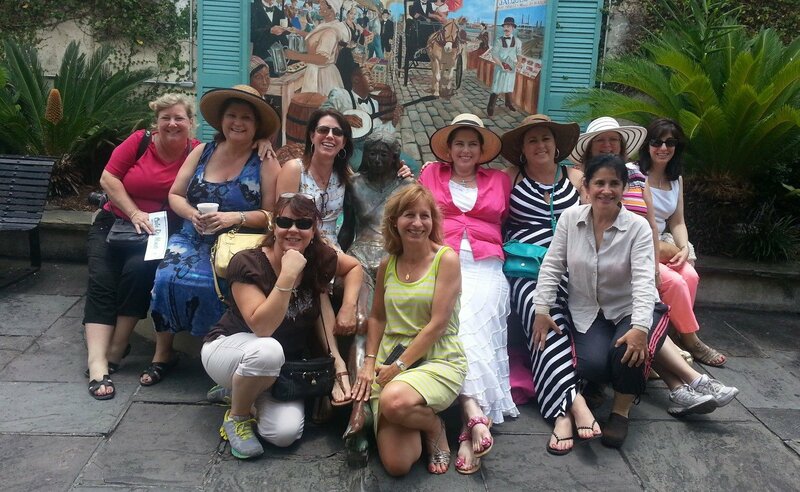 We rented a house in the French Quarter and worked our abs by laughing harder and more often in those three days than I have laughed for years. There is nothing like a group of friends who know your old secrets and keep them, except when they make a great story when you are all together. We have so many inside jokes and shared adventures and traditions but one of my favorites is that we always take a photo at each wedding of all the girlfriends with the groom. Here's the one from our wedding more than 27 years ago. 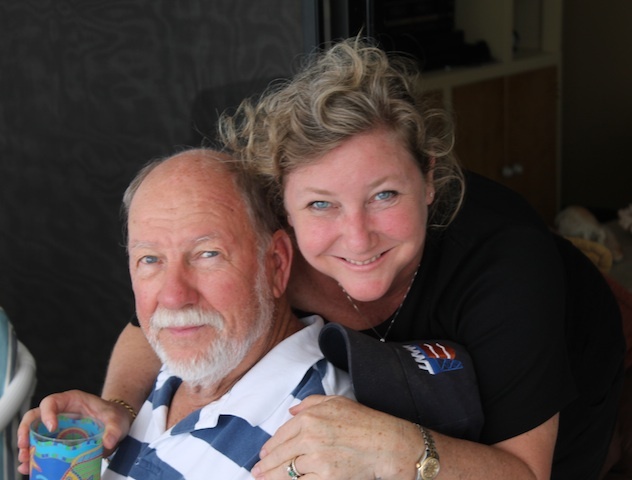 My sweetie (Isn't he handsome?!) with my beautiful friends. And here we all are now. Seven of us have been friends for more than 40 years! We just met the immobile girl in the middle. So, I am baking muffins this morning on actual Muffin Monday and our chosen ingredient is peppers. If you have been reading along for a while, you know I love spicy things and cheesy makes everything better. These are perfectly both. Preheat oven 350°F or 180°C and prepare muffin pan by greasing or lining with paper muffin cups. When I am baking with cheese, I find that the paper liners stick to my muffins so I usually just grease the pan. You might want to do the same. 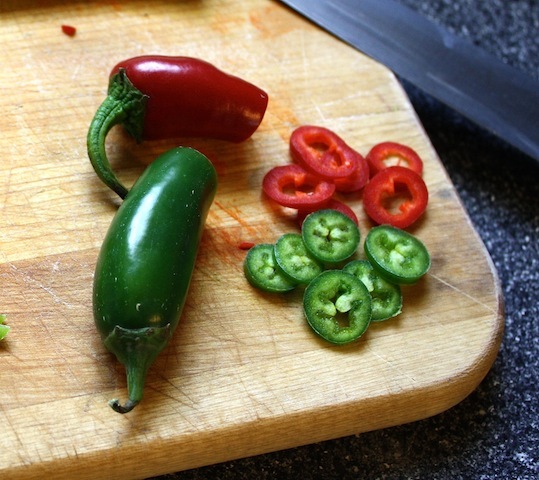 Cut 12 thin slices off of the skinny ends of your peppers and set aside to use for decoration before baking. Chop the rest of the peppers finely, removing the seeds first, if you don’t like things too spicy. Grate your cheese. Set some aside for sprinkling on top of the muffins before baking. In a large bowl mix together your flour, baking powder, mustard powder and salt. Add in the big pile of cheese and stir until well mixed. In a smaller bowl, whisk your milk, canola oil and eggs. Now fold in the chopped peppers. Top with the extra cheese and one slice of pepper per muffin. 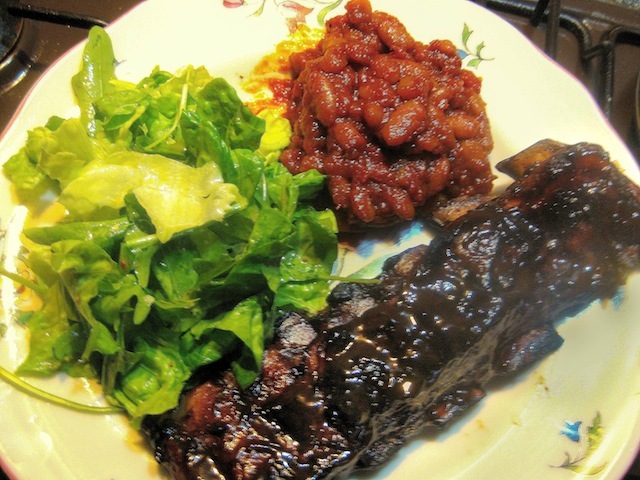 Remove from the oven and allow to cool for a few minutes in the pan. Remove the muffins from the muffin pan and finish cooling on a rack. Even before I became a food blogger and got in the habit of posting recipes for you lovely people a couple or three times a week, when I went on holidays, my favorite ones included accommodation with a kitchen: Vacation rentals from VRBO or most recently from airbnb which allow you to choose the number of beds and bathrooms and well-equipped kitchens. Right after hanging out on a beach, my favorite holiday activity is poking through foreign markets and grocery stores and cooking up my discoveries. I know this is contrary to many folks’ idea of a get-away. In fact, I’ve been told it’s abnormal and eating out and not having to cook is the whole idea of a holiday. What can I say? At least my hobby is useful. :) What’s your favorite thing to do on holiday? Ever bought a weird ingredient? 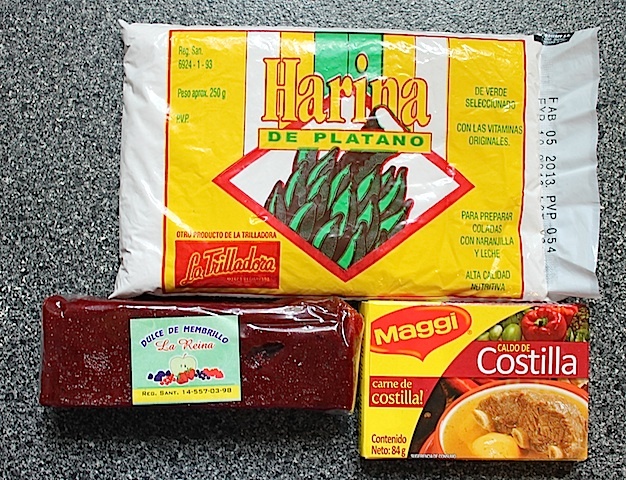 What I bought on this trip to Ecuador: plantain flour, quince paste and rib stock cubes. 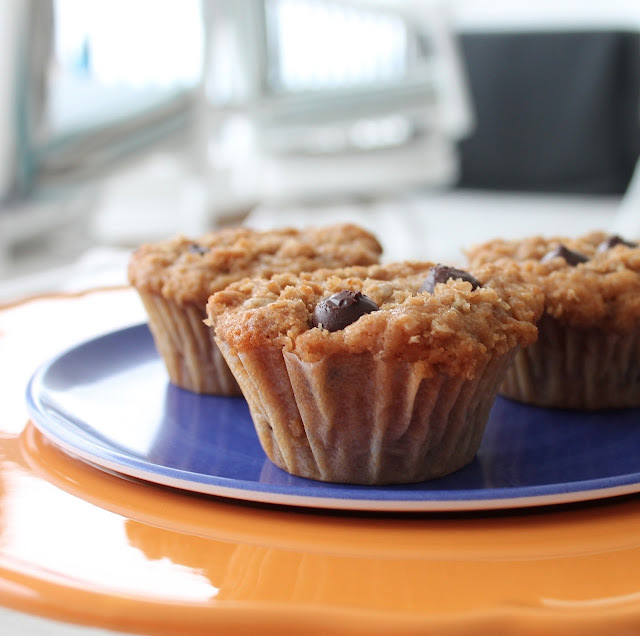 This week’s Muffin Monday ingredient is oatmeal. Since I was visiting my father and his wife and I had no idea what their kitchen was like, I brought along some of those little foil cups. They work pretty good, if you don’t mind that they spread out a little, your muffins end up flattish on top and sometimes a little batter oozes over the sides while baking. Preheat oven 350°F or 180°C and prepare muffin pan by greasing or lining with paper muffin cups or putting those little foil muffin cups on a bigger baking pan. In a large bowl mix together your flour, oatmeal, dark brown sugar, baking powder and salt. In a smaller bowl, whisk your milk, melted butter and eggs. Prepare your topping by mixing together the crumble ingredients with a fork. Set aside. Now fold in the chocolate chips, keeping a few back for topping, if desired. Top with the crumble and scatter a couple of reserved chocolate chips. Gently press down into the batter. Remove from the oven and allow to cool for a few minutes. Remove the muffins from the muffin pan.